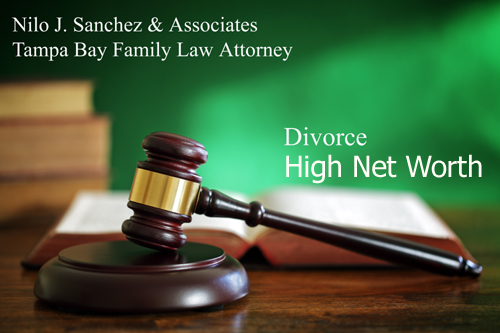 To Discuss your High Asset Divorce with Mr. Sanchez, Contact our Tampa Divorce and Family Law Firm at 813-879-4600. Nilo J. Sanchez & Associates focuses on handling high asset divorces and family law litigation. Tampa divorce lawyer who understands these matters which can become complicated. You have worked hard to build your business and to build your portfolio, and it is our job to ensure it is well protected during your divorce. Financial experts when necessary can be utilized to make sure your interests are protected and Mr. Sanchez will fight aggressively to ensure the best results in your high net worth divorce case. In general, all assets acquired and liabilities incurred by either spouse after the date of marriage and that are not otherwise classified as non-marital, are presumed to be marital assets and liabilities and are subject to distribution between both parties by the Court. If your divorce is considered a high asset divorce, you need a Tampa divorce lawyer who can aggressively handle your case. Characterization of assets can have a dramatic effect on the way it will be divided. We help clients who may have divorces involving intellectual property, business interests, reimbursements, inheritances and other assets. Complicated tax issues can permeate a high asset divorce. Nilo J. Sanchez & Associates has the legal and financial experience to minimize your tax consequences.